The nice people at Lucky Leaf contacted me and asked if I wanted to test their pie fillings (of course I couldn't decline, they're high quality and made with great ingredients! And my Tall Man loves pie, so it was a win win. And by the way- did you know you can buy pie filling on Amazon? They really do have absolutely everything). I couldn't stop thinking about cobbler and then I thought, "If I love cheesecake brownies so much, why not cheesecake cobbler?" So, thinking like brownies, I made a some cheesecake filling and swirled it into the topping. It tastes great but I was really disappointed when you couldn't see the swirls after it finished baking. Next time, I'm going to try adding two cans of filling- because it was really, really great- and swirling the cheesecake into that so the effect is better. In that case, I would do this the old fashioned way- sprinkle the cake mix over the filling and dot with butter. Bake and enjoy. Either way, this is long gone around here and my little man especially loved it. Hope you have a great Memorial Day weekend and get your summer off to a good start! Let me know what your favorite "summer" food is. A few days out of the kitchen was enough for me- I'm ready to go! Combine all ingredients and mix until nice and smooth (about one minute on high in the KitchenAid). Preheat the oven to 350. Spread both cans of pie filling over a greased 10 x 13 pan. Drop large spoonfuls of the cream cheese mixture evenly over the filling and cut through with a knife to swirl, dragging the cheesecake through the filling until you like the look. Sprinkle the cake mix over the top and dot with butter. Bake until bubbly and starting to brown (about 25-30 minutes in my oven). Yum! It looks delicious and two great flavors combined into one luscious dessert! Thanks! Yummy! I'm want some of that. yummy!! a combination of my two favorite desserts!! Glad to hear you've recovered. (And even the littlest Strawberry was sick? That poor baby . . . I remember those days!) Your dessert sounds delish. 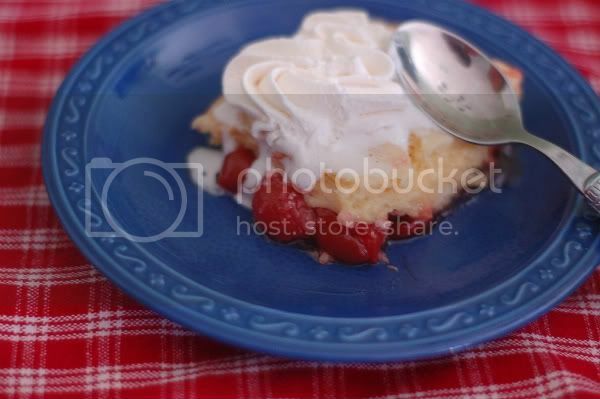 Cherries, cobbler, and cheesecake?? Count me in! This looks amazing! I hope you all get over the flu soon. I always get a cold when the weather turn warmer, it's so strange! don't remember any specific names of quilts stores in UT. I've been to so many and they are all good. (plus, there are so many new ones since i left.) one i went to was on state st. about 1/2 mile south of university on the east side of road. i've heard there are great ones in logan as well. good luck! It looks delicious! 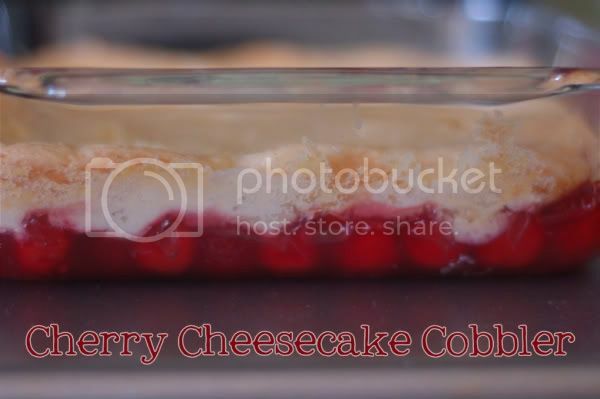 I love cherries and combining them with cheesecake...heaven! Thanks for sharing this nice recipe! I love this! I can't wait to try this one. Love this, love this, love this!! !